Last weekend, I went to see the Pompeii exhibit at the Franklin Institute. It was extremely well done. It was dramatic and just informative enough without being overwhelming. But more than that, it told a well-crafted story, only introducing scientific elements and historical and anthropological facts as they were necessary to show you what happened in this one tiny sliver of history: One Day in Pompeii. The curators of this exhibit did a wonderful job balancing the presentation of artifacts with information about the daily lives of the people who lived in the city, letting the visual and audio elements set the tone. We were eased into the experience of the horrific event, starting our day alongside the people of Pompeii. The first rooms tell of the history of the place, the architecture, the daily activities in people’s homes and in the town square. General information is countered with specific details. After a video on ancient Roman civil engineering, a tiny detail – the large clay pots used by wine merchants could stack. Suddenly, it was less intellectual, and I imagined a merchant heaving the great clay vases into their neat stacks. Then, the artifacts began to hint at what we knew was to come. My first moment came at a display of 17 pieces of silver, found in bag next to a skeleton who was presumed to be fleeing the scene when the earth began to shake, the money thought to be his life savings. It was a transformative gut-punch. Before, it was a sad story from the past, and suddenly, it felt present, and personal. After that, there was cookware tinged with fire damage accompanied by explanations of Roman eating habits and food preparation, surgical equipment, presumably used, and finally, the jewelry. Jewelry seems like it should be a fairly innocuous thing to show. Silly even, a curiosity. It’s just earrings and rings, and they all look just like what we’d wear now. Maybe that’s what made it so significant – here there was almost no distance between the viewer and the display. My first reaction to seeing some of the pieces was so very mundane, and not at all intellectual. It felt almost like shopping. Neat snake ring, I thought – I’d wear one if I had it. I would have loved that jingly bracelet when I was a little girl (I’m less a fan of noisy jewelry now). And then I read the description; the collection of jewelry was found with the bodies of people who had collected their valuables and taken shelter in an inn. This is the part where, embarrassingly, I started to cry. I could just see it – feeling the earth shake and the heat rising, a person grabs their jewelry collection from their dresser and runs to find safety, just like many people we know would do if their house caught fire. Its a familiar conversation: if you have to evacuate your home quickly, what do you grab? Your wallet? Your photo album? It was a small detail, but it was palpably real. After that, things got more intense, as we were presented with a video timeline of the events, with the sounds of buildings crumblings, human screams, and dogs barking, and then from there, the full body casts of victims, once again balancing scientific descriptions of the volcanic eruptions with almost literary descriptions of how the people died. It was mesmerizing and horrible, all at once. But I think the jewelry display was the turning point. Such a small detail, a single sentence describing a scene, and it was like a switch had been flipped. It wasn’t just history, or facts, or well-preserved frescoes, or ancient artifacts. 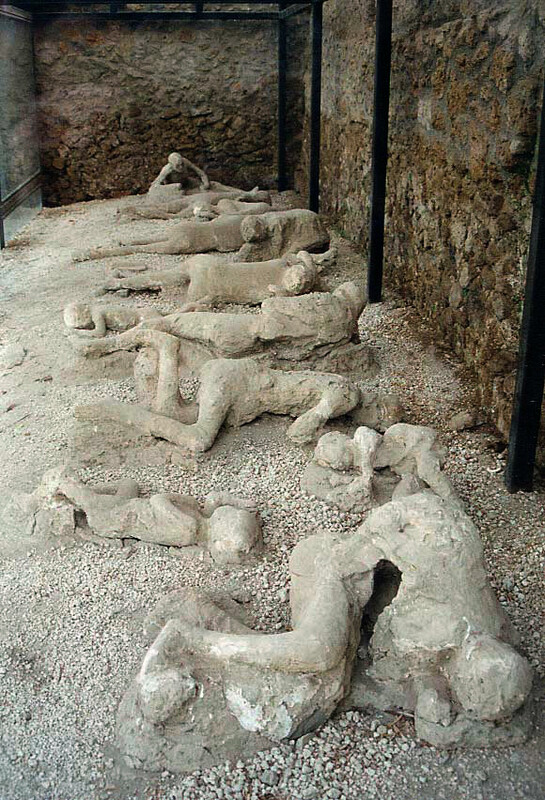 In a lot of ways, the value of Pompeii is that it has taught us so much about the advancement of the Romans and the way they lived. But this exhibit didn’t just tell the story of their lives, it told the story of their deaths, their fears, their last ditch efforts to survive, and how even in the shadow of Vesuvius, they kept hope. A person who grabs her rings and bracelets in a disaster is a person who believes she will live to trade, or sell, or even enjoy them again one day. And that made it all so very, very human. Okay, that was amazing. You totally rocked this one. Perfect way to start the day. I’m so glad you enjoyed it, thank you. Reading this is a very strange experience. It’s like I’m there with you at this exhibit, and then I’m there with you watching Pompeii burn around us. This is a powerful piece of writing. I really appreciate this comment so much – that was exactly how it felt to be there at the exhibit, it was so surreal. They did an incredible job with it.